Photography is a field where great minds come together to invent one technological breakthrough after another. One man who had much offer to the field of photography is Edwin Herbert Land. If you have ever taken a snapshot with a Polaroid camera or if you have Polaroid pictures in your room, then he is the man you have to thank. Edwin Herbert Land was as American scientist and inventor and he is best known for being one of the co-founders of the Polaroid Corporation. He was responsible for many photography-related inventions such as inexpensive filters that polarized light, his retinex theory for color vision, and his practical system for in-camera instant photos. His Polaroid instant camera, which went on sale in late 1948, made it possible for a picture to be taken and developed in just 60 seconds or even less. 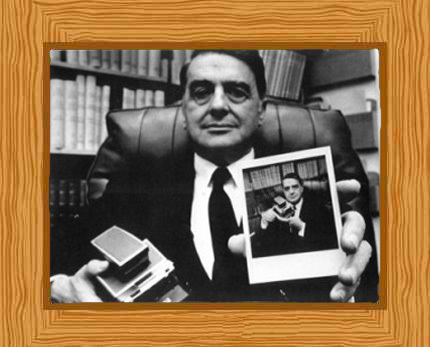 Edwin Land was born on 7th May 1909 to Martha and Harry Land in Bridgeport, Connecticut where his parents owned a scrap yard. Edwin was of Eastern European Jewish descent by way of both of his parents, and he attended the Norwich Free Academy located in Norwich, Connecticut. It was a semi-private high school and he graduated in 1927. The library from his school was named in his honor after he died since it had been funded by grants given by his family. After high school, he went on to Harvard where he studied chemistry but after his freshman year he left and travelled to New York City. It was in New York City that he invented the very first cheap filters that had the ability to polarize light; the Polaroid film. Given that he wasn’t affiliated with any educational centers at the time nor did he have the tools necessary for the project, it was a rather remarkable achievement. What he did was he crept into the Columbia University laboratories during the late hours so he could use their lab equipment. He also visited the New York City Public library to scour scientific literature for works concerning polarizing materials and substances. He had his “eureka” moment when he realized that instead of working to grow a large-scale crystal made of a polarizing substance, it was easier to make a film that contained millions of micron-sized crystals instead. These crystals could then be coaxed to align with each other. In 1929 he married Helen Terre Maislen and they had two daughters, Jennifer and Valerie. After he developed polarizing film, he went back to Harvard University but he didn’t quite finish his studies and get his degree. Perhaps the problem was that as soon as he found a certain solution to a problem, he lost all interest to write down his findings or find a way to prove his vision to other parties concerned. His instructor resorted to asking his wife to retrieve her husband’s answers for his homework problems. She would then take it upon herself to write the answers down so he could submit it and receive a credit. In 1932 Land started the Land-Wheelwright laboratories with his physics instructor from Harvard, George Wheelwright. The lab was created so they could commercialize the polarizing technology that he had invented. Wheelwright came from a wealthy family and he agreed to finance the business venture. After a number of early successes with polarizing filters for shades and photo filters, their lab received funding from investors from Wall Street so they could expand their business. The larger company was given the name “Polaroid Corporation” in 1937. Land continued to make further developments to his products and invented sheet polarizers which he placed under the Polaroid trademark. The initial application for his product was for use in sunglasses and scientific work however, he found other uses for it. Soon, he was using polarizing filters for color animation, glasses in full-color 3D movies, controlling light brightness through windows, as a component for LCDs, and much more. During the Second World War, he worked in military projects and devised dark-adapt goggles, passively guided smart bombs and target finders. He also invented the Polaroid vectograph, a special stereoscopic viewing system which revealed the enemy even if they were camouflaged. On February 21, 1947, he invented the famous instant camera and related film. He called it the “Land Camera” and it went on sale commercially in late 1948. His company originally produced just 60 of the cameras and 57 units were put up for sale at Jordan Marsh in Boston. It was thought that the camera would not be hugely popular but they were wrong; all camera units were sold on just the first day. Polaroid produced the camera for over 40 years and a color version of the instant Polaroid film was made in 1963. During his years with the company, Land was notorious for having marathon research sessions. When Land came up with an idea, he wouldn’t stop experimenting and brainstorming until he had a working solution. In fact, he would forget to eat if food wasn’t brought to him. As the company grew, he had teams and teams of assistants working different shifts right by his side. As one team wore out, another was brought in so he could work uninterrupted. That was how much of an obsessive worker he was. Harvard awarded Land an honorary doctorate in 1957 for his lifetime of scientific achievement. Land was interested in light and color research. In the mid 1960’s, Land proposed his retinex theory of human color vision to account for color sensations in real scenes. Land held over 500 patents when he retired from the company in 1982. Edwin H. Land bid died on March 1, 1991 in Cambridge, Massachusetts. He lived to the age of 81 and upon his death, his trusted personal assistant destroyed all his personal papers and his notes. His body was laid to rest at Mount Auburn Cemetery in Cambridge.